Learning from Exploration #01 -23/06/2018 – What Could A Farm Be? Sweet and energetic was the start of muu-baa’s first exploration, at Hotel Amazonas, Aspmayrhof, on Saturday 23 June. For those who do not know Aspmayrhof yet, this “bio-diverse” farm is definitely worth a visit. From 10.30am to 4.00pm, five farmers, five designers, four artists, four researchers, a communications specialist, a specialist in corporate governance and innovation and a regional development manager worked together on the topic of diversity, from biological, agronomic and anthropological perspectives. It was the second workshop by What Could a Farm Be, after the one on Open farm(-ing), in Malls/Malles. A participatory workshop, as a learning practice, is a format for explorations/experimentations that combines doing with thinking. There is a balance between guidance and participants’ own initiatives, between planning and unpredictability, and between success and failure. In these workshop experiences, participants and facilitators share, generate and negotiate language and methods. After a breakfast under the sun, the workshop on the farm started with introductions through a ‘speed dating’ activity. Each participant wrote salient details about themselves on a piece of cloth worn in different modes by each individual. A short talk by Prof. Fuad-Luke raised questions about our understandings of (Bio-)Diversity and introduced a conceptual tool, The Diversity Triangle. 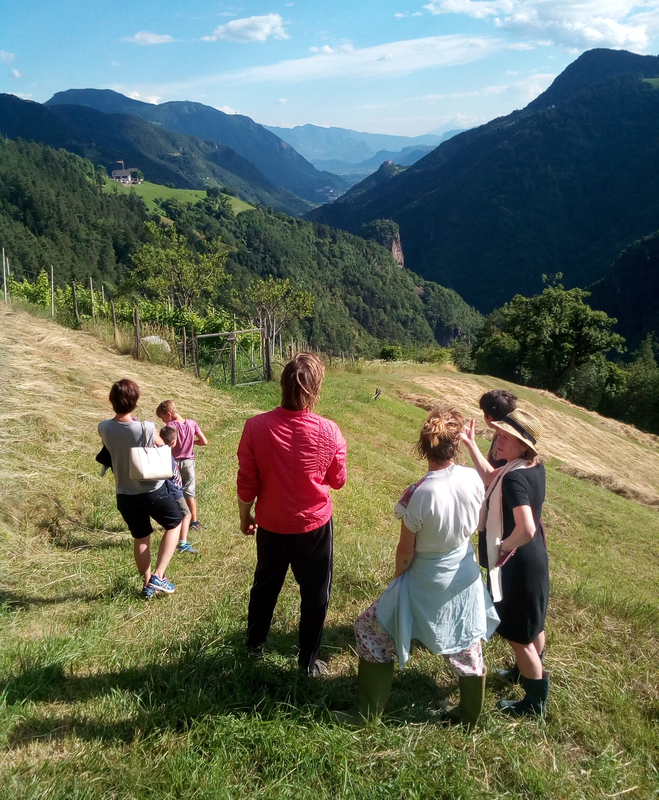 Then, participants focused on developing a Food Timeline for South Tyrol/Alto Adige/Süd Tirol, from Neolithic times to the present day. They applied their own knowledge, talked among themselves and referred to a small library of books made available. Participants were later asked to draw typical meals that represented different times on the timeline and to speculate on what the foods of the future on our plates would be. After a delicious, mainly locally sourced lunch participants turned their attention to asking, with the World Café method, “What are the opportunities in (bio)diversity?”. Key insights from the World Café concerned the shift of paradigm and model. For instance: shift thinking from farm as food production centre to farm as an ecosystem and habitat; shift bureaucracy from heavyweight to lightweight but only for bio-farmers; shift values from a false sense of nostalgia to a new nostalgia; de-accelerate, “retro farming”, “retro food”. The workshop closed with the results of these discussions. Some of the participants then walked around Aspmayrhof with our hosts Margareth Kaserer and Simon Steinburger. Explorations #01 (Bio)diversity? gave room to investigate the imaginary on farming and to identify issues and opportunities, as perceived by the participants from different communities. We can say that the workshop participants are a community of thinkers, makers and creators who question different, possible ways of living (on this planet, in this society, valley, ecosystem, economic-system). This heterogeneous group started to learn how to work together, to generate common language and methods of explorations and practice, in a sort of hybridisation of intents, benefits and codes. As researchers and facilitators, in the framework of exploration as a collective learning process, a key challenge is how to make the most of each participant’s knowledge and potential. This means reflecting on the methods and the languages applied and generated in the participatory processes. The ultimate aim of these explorations is to encourage others to explore. Pingback: salto.bz + Zeppelin – What Could A Farm Be?